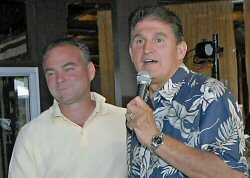 February 11, 2009 by Ken Ward Jr.
West Virginia Gov. 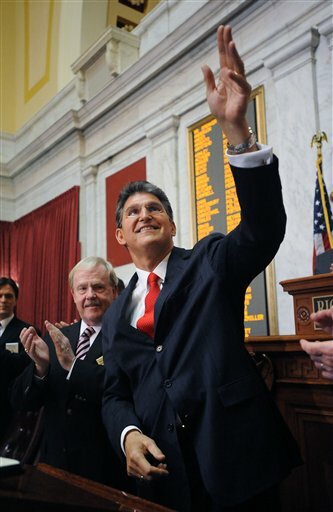 Joe Manchin had been hinting for months that he planned to introduce major energy legislation aimed to encouraging more “alternative” and “renewable” electricity production in the Mountain State. But it comes as no surprise that Manchin has carefully crafted (and named) his proposal so that it protects the coal industry. 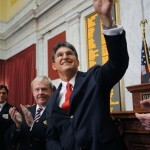 I’ve posted the draft text of Manchin’s “Alternative and Renewable Energy Portfolio Standard” legislationÂ here. Well, it’s important to note first of all that Virginia’s Renewable Portfolio Standard (RPS) is strictly voluntary. And in fact, American Electric Power spokesman Mark Dempsey told me tonight that his company would have preferred that Manchin take the route of a voluntary program, rather than a binding standard. So in that regard, the coal-fired power industry did not get everything it wanted from Manchin’s bill. Instead, Manchin seems to have modeled his proposal, at least in part, after similar programs in Michigan, Ohio and Pennsylvania. All three states have programs that require power companies to get credit for “alternative” or “renewable” energy if they get power from a coal-fired plant that uses some advanced form of controls to limit carbon dioxide emissions. At least 10 percent of energy must come from renewable energy by 2015. Up to 10 percent of that requirement can be met with coal-fired power plants that reduce emissions by 85 percent relative to average coal plant emissions, or from Integrated Gasification Combined Cycle plants that reduce emissions by 70 percent. By 2025, at least 25 percent of electricity must come from alternative energy sources. Half of that can be met through coal-fired power plants that control or prevent carbon dioxide emissions. At least 18.5 percent of electricity must come from alternative sources by 2020.Â Almost half of that can come from waste coal plants or from coal gasification plants. Judi Greenwald, a vice president at the Pew Center, told me that whether Manchin’s bill is considered progressive or not depends on what he’s trying to accomplish. “If you’re just looking at climate change, as long as it’s low-carbon, it’s good,” she said. But environmental groups (and many energy experts) are looking these days not just at carbon emissions, though that is clearly at the top of the list of considerations when judging an energy bill. With coal, Greenwald said, there are many other factors to consider, from the damage done by mountaintop removal to the potential toxic hazards from power plant ash dumps. Still, she said, Manchin’s proposal — like those before it in Michigan, Ohio and Pennsylvania — probably makes sense, at least from a political standpoint. “In these states, where coal is such an important part of the mix, it probably makes more sense politically,” Greenwald said. I’ll be blogging more about this, and probably writing more for our print edition as well. And you’ll want to make sure to check out the rest of our State of the State coverage and follow the Gazette’s new legislative blog, the Squawk Box. Thank you for the comparison to other states. 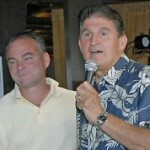 “The folks” (actually, Clem G.) at WVaBlue.com also suggested Manchin turn to Gov. Ritter of Colorado for innovative ideas. Here’s what Colorado’s Renewable Standard looks like, according to the Pew Center. On March 27, 2007, Governor Bill Ritter signed House Bill 1281, which increased Coloradoâ€™s previous renewable portfolio standard. Under the new standard, large investor-owned utilities are required to produce 20 percent of their energy from renewable resources by 2020, 4 percent of which must come from solar-electric technologies. HB 1281 requires municipal utilities and rural electric providers to provide 10 percent of their electricity from renewable sources by 2020. Sources of energy that count toward the standard include solar, wind, geothermal, biomass, and small hydroelectric. Thanks for the update. Any idea what the percentages are today for renewable energy production and/or current projections for 2015 or 2025? Was that a rhetorical question, Clem? For EIA’s WV data on electric power by type of producer and energy source, see records 29648-29657 in this spreadsheet (http://www.eia.doe.gov/cneaf/electricity/epa/generation_state.xls), which indicate wind accounted for 0.178% of the fuel supply for WV’s electric power industry in 2007. Hydro accounted for a whopping 1.335%. Wind and hydro were the only two renewable sources. Coal accounted for 97.8% of the fuel supply. At 160 million tons of production a year, that amounts to ten or fifteen years of production at current levels. Of course there is a lot of unreported coal, so that number doesn’t tell the whole story. Perhaps better is the more sophisticated econometric method that EIA uses for calculating the future of coal production based on labor productivity, and other factors. But, even those more generous estimates in EIA’s “annual energy outlook” have found that Central Appalachian coal production will likely decline to 60% of its current levels by 2030 (from 235 million tons in 2006 to 144 in 2030). Thanks, those are helpful. What I’m really wondering is what is projected based on existing large-scale projects. Those statistics don’t include the projects that just scaled up like Allegheny Front wind farm (can’t remember formal name for it). I’m trying to determine if these % gov’t targets are likely to change any behavior vs. just putting numbers in front of market trends.